The second in a series about abandoned roads in New Castle County. Like abandoned railroads, "old roads" sometimes make valuable connectors (or a trip back in time). GBC (Glasgow Business Community) Drive, its 0.9 mile eastern section, was abandoned in 2003. Siemens Healthcare Diagnostics was no longer willing to maintain it. 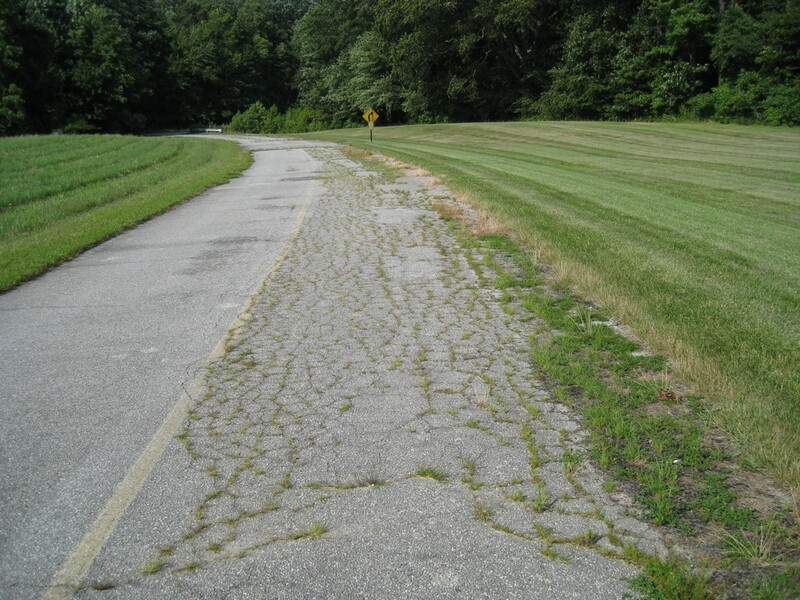 An attempt to transfer ownership to New Castle County failed because it would be prohibitively expensive to bring the road up to DelDOT standards. So minus the occasional Delmarva utility vehicle (substation access), GBC remains closed to motor vehicles, bicycles and pedestrians -- though the latter two are not enforced. View GBC Drive on Google Maps. The abandoned section is highlighted in green. GBC Drive, as a whole, makes an excellent alternative to Route 40, just to the south (not pictured). It is popular among bicycle commuters now, providing access to Siemens AG, Hologic, Air Liquide, and numerous other companies on the west side of Route 896. The remains of an old DuPont card access gating system are found at the eastern entrance just off Route 72. "One person is dead after a bicycle collided with a dump truck near Laurel on Wednesday morning, police said". Well, that's not how it happened; the dump truck hit the rear of the bicycle with his bumper because he didn't see him. 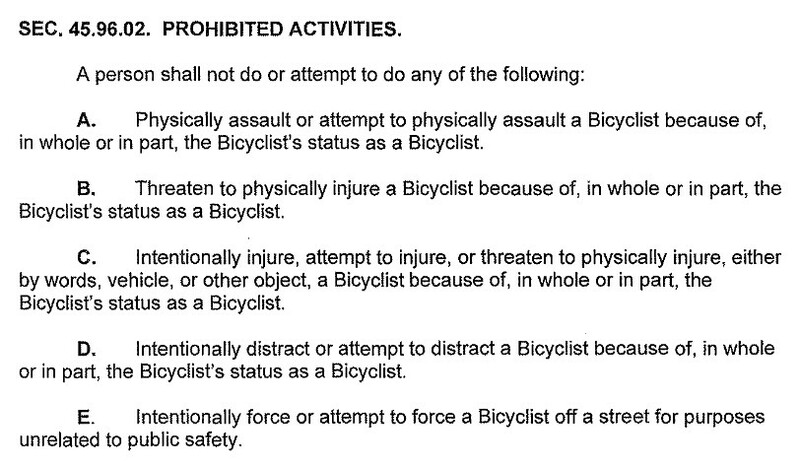 That is NOT a bicyclist colliding by any normal interpretation. It's just another bicyclist killed because he was mowed down by an irresponsible driver. The headline should have read "Bicyclist killed when struck from behind by dump truck". Just another senseless fatality that, like in most cases, the bicyclist (or pedestrian) is faulted when in fact the details show otherwise. A look at Bike Delaware's "Bicycle Friendly Delaware Act"
If the language of this bill survives as written, it would be significant and might push Delaware even higher than #3 in the League of American Bicyclists Bicycle-Friendly States ranking. It would also make Delaware only the second State after Idaho to legalize rolling stops for bicyclists. 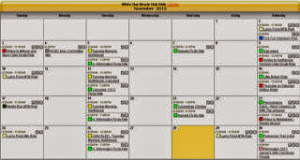 Even though HB-185 (if passed) will see little to no public education -- never mind enforcement -- strong language is still critical for incident reporting. As it stands now, even if you bike with full time video surveillance and capture the tag number of an offender, going to law enforcement is a lesson in futility. 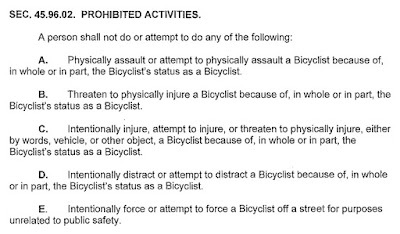 For example, the Delaware State Police insist that shouting at bicyclists and pedestrians from an open car window is protected under 1st Amendment free speech. This bill could have been the opportunity to fix that, and allow charges to be filed. In the long run, it could send a strong message that such behavior will not be tolerated. Below is a short 7 second clip of one such incident, which is not uncommon, that was much louder than the camera recorded. 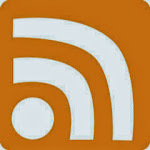 Had it not been for the use of hearing protection, the bicyclist might have been startled into loss of vehicle control. Despite this deficiency, and Bike Delaware's usual fail at consensus, HB-185 is worth supporting as an attempt to bring road bicycling into modern times. I have always maintained that bicycle mode share in the U.S. will stay well below 1% of all trips as long as there's abundant and cheap gasoline. This superb article in The Guardian makes the case, brilliantly. 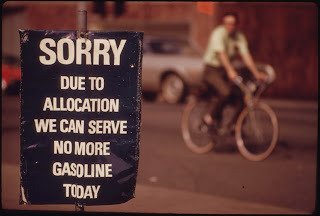 In the early 1970s, existing high gas prices from declining U.S. production -- followed by the Arab Oil Embargo -- put prices and availability out of reach for most folks. For 3 years, bicycles sold like snow shovels on the eve of a storm; bicycle shops struggled to keep pace. Bicycling became widespread, and an accepted form of transportation. In 1973, 252 bicycle-oriented bills were introduced in 42 states. The Federal-Aid Highway Act of the same year provided $120m for bikeways over three years. US bicycle sales, which had been rolling along at 6 million a year, shot up to 9 million in 1971, 14 million in 1972 and 15.3 million the following year, according to a Bank of America report. The bike had turned out to be the hula hoop of the 1970s: all the rage one minute, all but forgotten the next. Bike sales in the US fell by half within months. Despite the obvious flip to cycling in America from the 1973 Opec oil crisis – when fuel was in short supply and getting around by car became expensive and, because of oil-saving speed restrictions, slower – cycling hadn’t changed the world. The bike-friendly John Volpe left the Department of Transportation to become the US Ambassador to Italy. State highway planners reined back what had been grandiose bikeway plans. Bike shop lines thinned out to nothing. Bicycle manufacturers cancelled overseas orders. Unfortunately, we may not live to see this repeated, much less ingrained. Climate change (emissions) alone are not going to sway Americans to at least try other modes. Indications are, pump prices won't be increasing anytime soon, and even if they are, it won't be nearly enough to change driver behavior. The ability to extract vast amounts of oil from multiple sources, using advanced technologies such as "Fracking" can readily put the world in an oil glut. As such, and regardless of what some advocacy orgs like to think and preach, the prospect for bicycling as mainstream transportation in the U.S. will remain bleak. 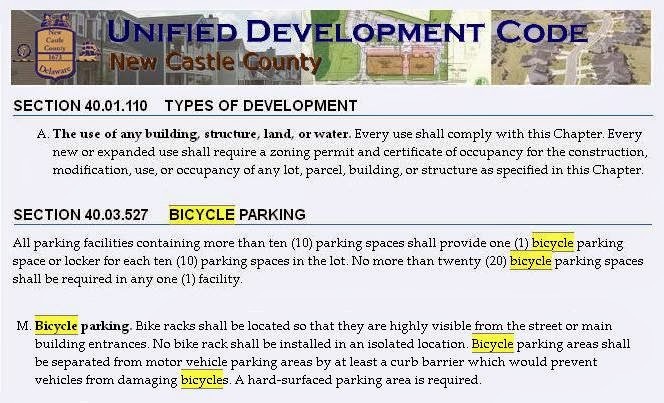 The New Castle County Unified Development Code is clear about the requirements. Why isn't it being adhered to? Too often, New Castle County issues a certificate of occupancy despite clear violations of the Unified Development Code (UDC). Bicycle parking and handicapped access (as per the American Disabilities Act) are required components of NCC's Unified Development Code, and are supposed to be installed and verified before a new building owner is granted a certificate of occupancy. 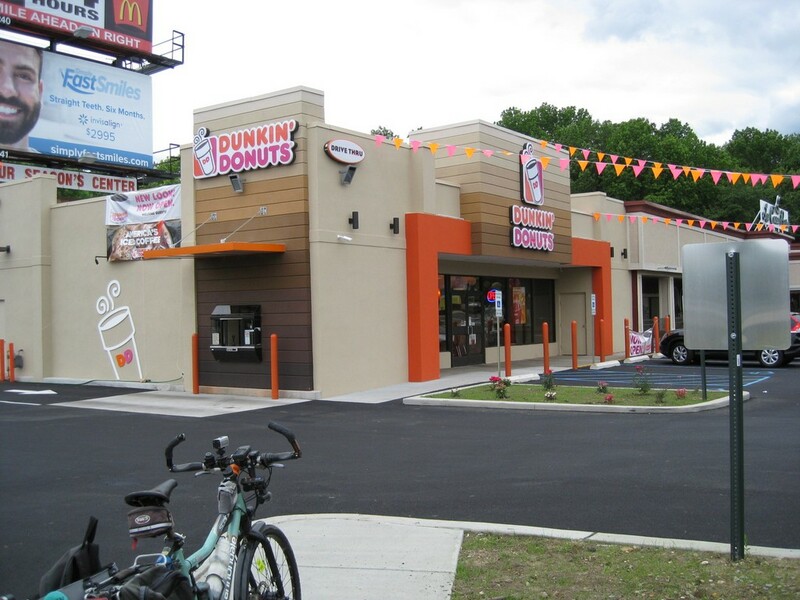 Our latest spotlight falls on a brand new Dunkin' Donuts, located next to the 4-Seasons Shopping Center on Rt.896 in Glasgow. 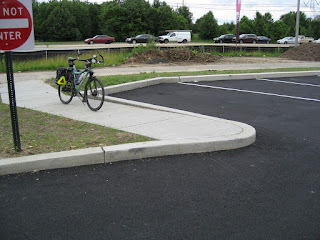 There is no sign of a bicycle rack, and pathway access has a high curb. Unfortunately, once the certificate is granted, there is no turning back; the code becomes virtually impossible to enforce. It is for this reason that a funding pool should be established, perhaps fed into by government agencies as well as private sources. 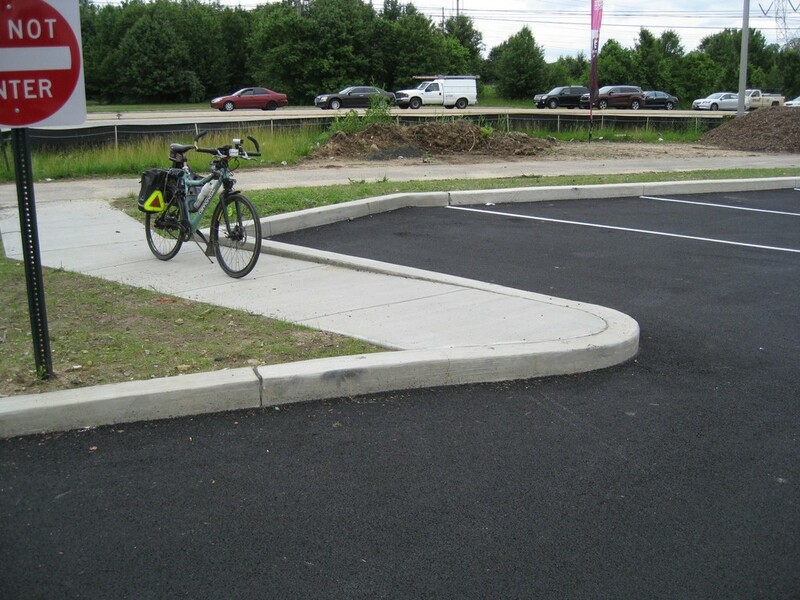 Bicycle parking could then be installed on an as needed basis, where it's needed most, via DelDOT work order. Until then, folks on bikes will have no place to lock up for the majority of their trips. Stay tuned as we contact NCC officials for an answer. We also need to update the language in the code, to reflect the need for APBP compliant bicycle parking (wheel and frame support). The City of Newark updated theirs several years ago, and at least there, wheelbending "toast" racks should be a thing of the past. 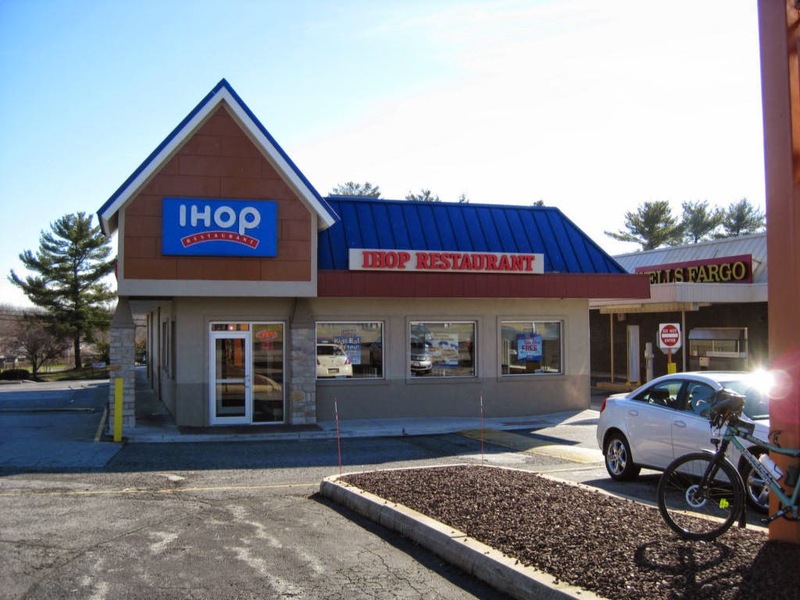 This new IHOP on Kirkwood Highway had its bicycle parking waived in 2014. Land use officials claimed that it involved the retrofit of an existing building.